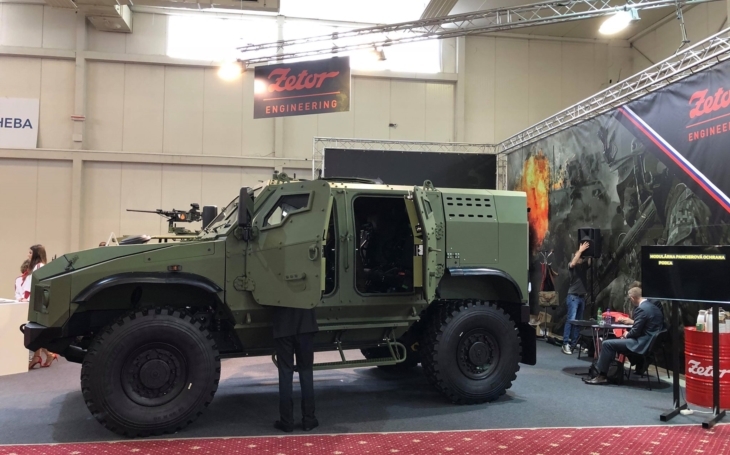 The vehicle concept was initiated three years ago by the company Zetor Engineering CZ in close cooperation with the subsidiary Zetor Engineering Slovakia, a. s., member of HTC Investments group, upon request of the Slovak Army which needs a replacement for its outdated soviet-era BDRM-2 armoured vehicles. The prototype has been unveiled in Bratislava during the IDEB 2018. The protection levels for the Light Armored Vehicles is by the NATO AEP-55 STANAG 4569 standardization agreement. The standard level for this category of vehicles requires the vehicle to sustain a 6kg AT mine explosion under any wheel of track location, and under center (Level 2a, 2b). Gerlach can be readied with different degrees of ballistic and anti-mine-blast protection provided in STANAG 4569 – Volume 1 and Level 3 ballistic protection and Volume 2, Level 3a and 3b anti-mine protection. Besides fire from the small assault weapons used in current conflicts, the vehicle is thus able to withstand anti-tank mines with the equivalent of up to 8 kilograms of TNT, both under the axle and under the cabin. The cabin of the Gerlach vehicle is designed as an armoured capsule with a safety space of 7.7 cubic meters, and is resistant against IED traps. Compared to standard space for four or five people, it has enough room for a six-member crew up to 190 centimeters tall and weighing 130 kilograms including gear. When necessary, space can be provided for an additional two crew members. The cabin is anchored independently of the vehicle undercarriage, so the crew remains protected even if the vehicle itself is damaged. The cabin is also designed to enable the crew to evacuate it very quickly. An important parameter of vehicles in this class is their dynamics, which is measured by the ratio of power to vehicle weight. With its 240-kW, six-cylinder MTU engine the Gerlach has an exceptional ratio of 17.1 kilowatts per tonne. During the tests carried out in rainy weather it was able to reach a maximum speed of 125 km/h. Gerlach is a highly variable vehicle that can carry a further 1.5 tonnes of necessary gear and equipment, and various armament systems. Vehicle versions can be rapidly altered to meet requirements of a given mission. The basic version has a curb weight of 12 tonnes with filter ventilation plus air conditioning and protection against chemical, biological and nuclear weapons already installed. Its 220l fuel tank provides for 800 km of range.